Striata Spotlight Insights Is eBilling Delivering the Goods? The cost saving potential of eBilling is undisputed. The challenge is to realize these savings. In today’s Newsflash, Alison Treadaway (Director – Striata South Africa) talks about delivering cost reductions by focusing on the logistics of stopping the paper. Electronic billing has managed to remain on the ‘to do’ list of many organizations that are putting other IT projects on hold. Arguably, this is because eBilling is one of those IT projects that is not only aimed at eventual (and difficult to measure) improvements in efficiency, better customer service and marketing opportunities, but one that can actually realize tangible cost savings. The primary challenge in realizing cost reductions through implementing eBilling is the ability to stop the paper. This particular challenge has many aliases: paper suppression, truncation and paper reduction – but it all boils down to the same thing: can the organization legally, technically and procedurally, stop sending the paper version of the electronic document? The costs associated with printing and delivering paper-based invoices, statements and other documents is the direct target for an eBilling return on investment calculation. 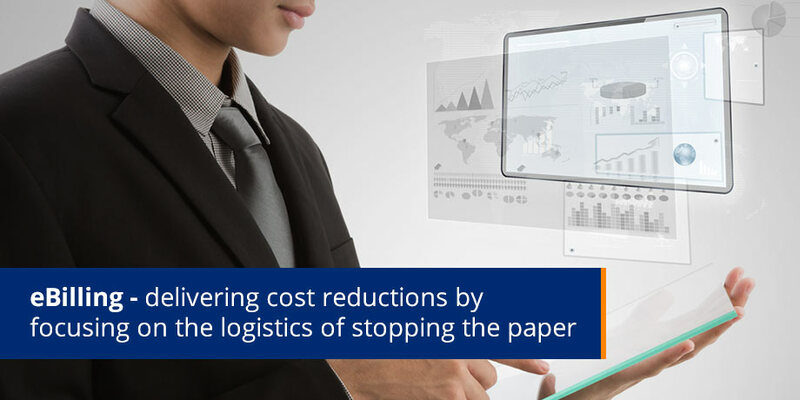 In order to deliver cost reductions, the organization must also focus on the logistics of stopping the paper. Legally, there are various issues to consider. For example, an issue in South Africa is compliance with the relevant financial and communication Acts, which in the local environment include the Value-Added Tax Act (1991), the Electronic Communications and Transactions Act, and the South African Revenue Services requirements for an electronic invoice. There’s also the process of acquiring permission to communicate with a customer electronically, which requires that organizations change their mandate or terms of engagement, to request and record this permission. Technically, stopping the paper can be extremely complicated. Years of print processing have resulted in complex business rules being built into various stages in the preparation of a document. In order to create an electronic version, those business rules need to be redefined and applied to the electronic process. The most challenging issue is upgrading multiple systems to allow for the suppression of the paper document. It sounds simple, but to the teams managing these systems, it is not a straightforward upgrade. Architectures tend to evolve organically to cater for emerging requirements, and introducing the electronic channel will impact, potentially with a knock-on effect, on multiple systems. Procedurally, there is a whole new channel to support. Call center agents have to be trained to assist electronic bill recipients. Where previously a support agent dealt primarily with business-related queries, now the agent needs to skill up to assist with technology-related queries. There are not many support calls into a call center on how to open an envelope, but there will be support calls regarding how to access an electronic or online bill. Historical processes that dealt in the paper environment now need to be transposed into the electronic realm. Most organizations have processes in place to resend an invoice: print the invoice and fax it or post it to the recipient. The electronic channel adds the requirement for the accounting clerk to access a system, execute a search and resend the electronic version. This is much quicker, simpler and cheaper to do electronically, but it does require system access and training. Without a doubt, the business case for eBilling is a strong one, taking into account all the costs associated with paper billing. There are the hard costs for stationery, printing, envelopes and postage. These hard costs can be astronomical if the document is printed in full color on high quality paper, with multiple pages in a large envelope and then delivered by courier. If the billing run process is not outsourced, then there are the soft costs, which require staff to fulfill certain processes, namely collating and folding documents, inserting into the envelope, managing the postage or courier service and resending lost documents. Added to this is the cost of managing undelivered mail. Assigning staff resources or paying a bureau to receive, record and action non-delivered envelopes is a costly exercise. Being able to respond to incoming communication in customer relationship management and inbound message handling systems greatly improves the ability to respond rapidly to requests and to record the conversation thread. So the potential for eBilling to produce enormous cost savings is there – it is the realization of those savings that are proving to be challenging for many organizations. This said, the feedback from international participants in this industry is that companies are seeing a lot of value in the opportunities provided by a regular email to customers. The obvious benefits being improved customer service and self-service, and cross-selling opportunities with innovative use of interactive technology.